Merry Christmas. Save 20% on many collectable toys and the favourite characters of kids. Baby Born, Fur Real, Little Live Pets, PJ Masks, Paw Patrol toys are available on pg 10-11 of the catalogue. One of the most popular toys of Paw Patrol is sea patroller that is only $119.99 at Myer stores now. Save 20% on Baby Born Little sister mermaid doll. Join the adventure of Thomas and Friends and reenact the scenes in your mind together. Educational toys like Mega Bloks, Fisher-Price are also subjects of the new discount. Find Nerf blasters that are joyful outdoor toys which keep all the kids busier than ever. If you have a large backyard or a really good place to run around, NERF Blasters can be a reason for kids to enjoy nature, too. Modulus ultimate pack, elite delta trooper, thunderhawk, and more products of NERF are also 20% cheaper. X-Shot blasters are also in the same place. 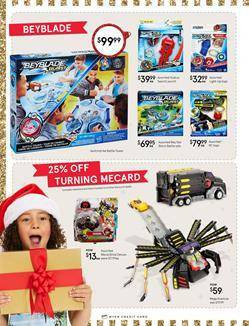 Beyblade, Hot Wheels, board games such as Monopoly and Scrabble are Christmas gifts people usually prefer. All of them are in the Myer Catalogue Christmas right now.